Have you ever been the beneficiary of someone paying it forward? Maybe someone paid for your coffee in the Starbucks drive through; or perhaps you and your gallon of milk were invited to cut in front of the dude with the full grocery cart at the supermarket. And how did that make you feel? Pretty darn nifty, right? Our hope is that you feel inspired to bake a pie (or even buy one — shhhh, we won’t tell), and then deliver it to a deserving person on Pi Day — Tuesday, March 14. And it can literally be anyone — though we do recommend it’s someone either in public service or that you actually know, otherwise it could seem a little creepy. But anyhow. 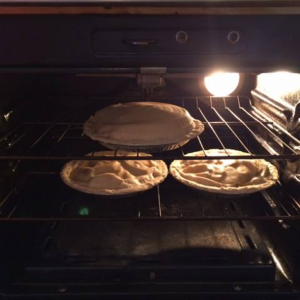 And all we ask is this: Take a pic of your pie (and/or your happy recipient), and share it with us on the Estipona Group’s Facebook page using the following hashtags: #PieItForward #PiDay #24Years24Deeds. So join us: Let’s turn Pi Day into Pi(e) Day! Oh, and because we love you, below is just one way we’re paying it forward. Here’s a recipe for a totally AWESOME pie, formulated by Estipona Group’s exclusive caterer, Chef Brooke Lampert of Divine Plate. Click here for more details about #24Years24Deeds. And regarding your recipe; feel free to share it, because it turns out that’s a good way to guilt trip someone into making it for you. Go ahead and try it. We dare you. 2) Hand held mixer or stand mixer with paddle attachment, cream softened butter for 1 minute (medium) once smooth add sugar cream till fluffy and light in color. Beat in egg, egg yolk and vanilla, scraping down sides as needed.